Humming Along Laser Cut comes with ready to iron black fabric with the design already cut out as well as easy to follow instructions to complete your project. 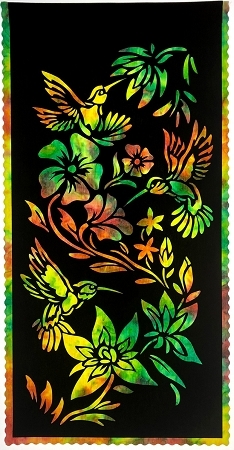 This hummingbird and flowers laser cut already has HeatnBond Ultra on it so all you need to do is peel off the paper and iron it to a batik of your choice to make a beautiful stained glass fabric window hanging. Approximate size 13" x 26 1/2"
Copyright Clotheslinequiltsandhandiwork. All Rights Reserved. eCommerce Software by 3dcart.